DO-10271-35 was succesfully added to your cart. These meters simultaneously measure and datalog several ventilation parameters using a single probe with multiple sensors. Great for cleanroom filtration airflow measurements — they automatically calculate volumetric flow rate for round, square, and rectangular areas. All models measure velocity, temperature and calculate flow.Model 10271-35 includes a probe that articulates up to 90°. Auto shut-off preserves battery life, and a low battery indicator alerts user of battery condition. Software, probe, USB cable, hard carrying case, four AA batteries, and calibration document supplied by the manufacturer. I need this intrument to measure humidity and be calibrated. I believe the velocicalc moodel I need is 9555 (no "-"). Do you offer that and what part numbers fo I use? Part number 9555 without any additional info is equivalent to our part number 10372-22. 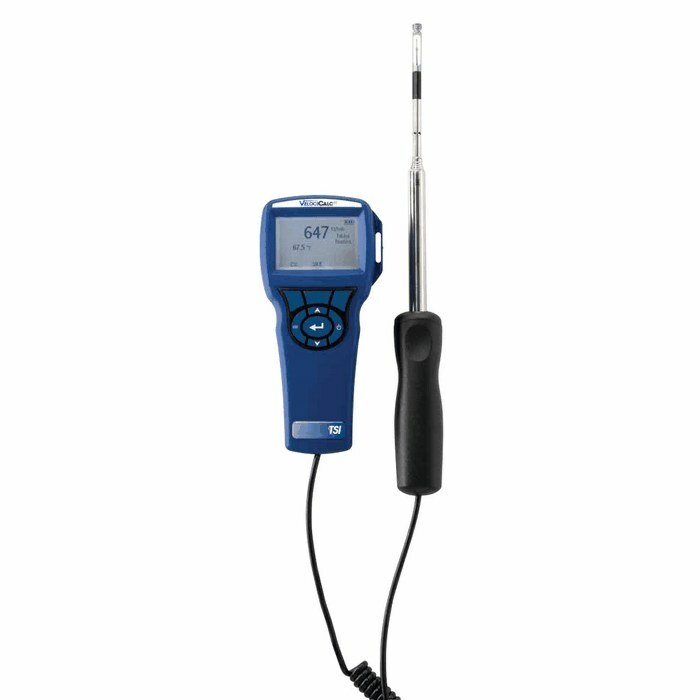 This meter only works with the probe that it comes with, which has a temperature range of 0 to 200 °F (-18 to 93°C).